Do you feel like you leave your auditions wishing you’d done better and others are getting your opportunities? Do you want a better understanding of the business as a whole so that you can be more empowered with knowledge? Don’t you want more than the simplistic re-direct that you get from the CD workshops in town? Join me for a 2-day intensive course to learn how to nail your auditions and grow as an actor. I will provide you with an insider’s view into the competitive world of auditioning from the point of view of directors, producers, studio executives and casting directors. Each week I will dissect one audition scene and take each of you through the audition process — from initial pre-read through callback to final callback/test on camera. Make a commitment to yourself and take advantage of a rare opportunity to sharpen your audition skills under the guidance of one of the most respected and successful casting directors in Hollywood. Because the highly interactive format will stress support and feedback, the course is limited to only a small number of participants. Cost for the 2-day classes is $350 which includes 7+ hours of expert instruction, coaching, and lecture. Classes are for 18 years of age and up. *Your acceptance to the program will be based on review of your materials. Once accepted, someone will contact you immediately with all details, payment info and confirmation of your participation! "Marci's DVD includes not only valuable information for auditions, but for future approaches in pursuing future roles. Coming from a professional casting director it is a primary source of information that is a wise and beneficial investment to any actor who takes their craft and working career seriously." "Marci Liroff's "Audition Bootcamp Part One" DVD is a must for beginning as well as experienced actors. It breaks down not only what you do to sabotage yourself at auditions, but it also shows you what to can do at auditions to make a good impression. I love how the DVD is organized and the bonuses included in the DVD. This is an investment that will pay big dividends!!" Wow! Marci really helps to demystify the casting process. The principles that she talks about in Audition Bootcamp are universally true whether you are auditioning in LA, New York or here in Toronto. I especially loved the section on self-taping. We have the technology today to show filmmakers all over the world what we can do but we have to use the technology properly to present ourselves in the best possible light. Marci shows us how. I have been to casting director workshops in the past and always got the impression that the workshop was mainly a device to generate revenue during slow periods in the industry. But with Marci you know you are being taught by someone who truly likes and respects actors and wants them to be at their best. I loved the video and I will be sure to recommend it to my Canadian actor friends. Thanks Marci. Marci Liroff demystifies the audition process with extremely practical information. Only an industry insider could provide such an accurate and insightful methodology. This DVD is worth much more than I paid!! 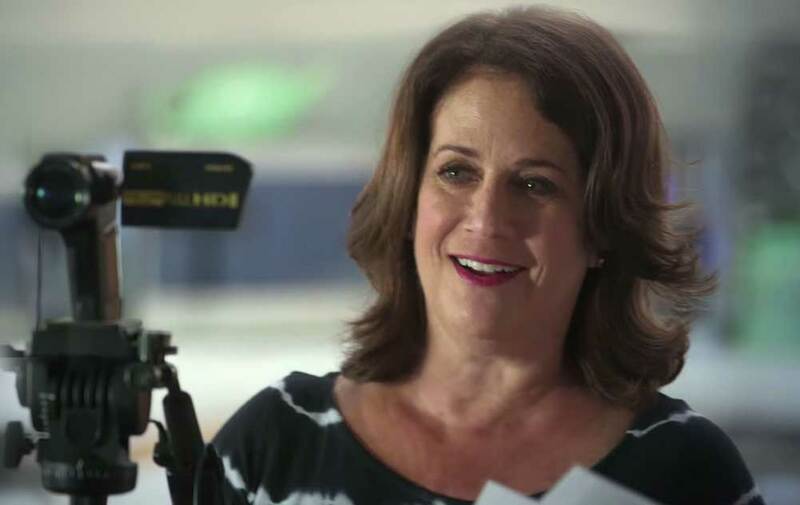 "Marci Liroff's Audition Bootcamp DVD - Imagine sitting down with a major casting director and having the opportunity to ask every question that comes to mind. That is how I felt when I watched Marci Liroff's Audition Bootcamp DVD. Marci gives actors the tools to do their best in auditions. There is so much I didn't know that I learned from this DVD, and I've been acting since I was little! 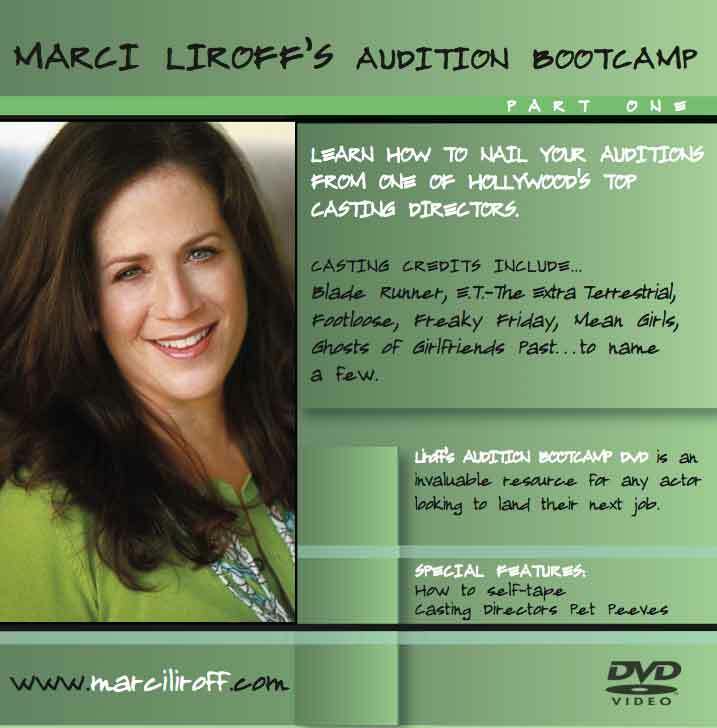 If you want to take charge of your career, you NEED to get Marci Liroff's Audition Bootcamp DVD!!" "The Marci Liroff DVD is a must have for actors. It's part of that set of tools in your tool bag or those arrows in your quiver that you need to get a better understanding about the business we're in. This is the next best thing to being in her studio and her immediate presence!" Watching Marci's DVD is like having a friend pull you aside after they've auditioned and fill you in on what the casting director was looking for. She gives you all the information you need to prepare to do your personal best! Although it would be great to take a class with Marci in person, the beauty of the DVD is that you can pause it or go back over something if you missed a point while taking notes, without feeling like an idiot by saying, "I'm sorry, could you repeat that?" (I took twelve pages of notes!) Marci has the experience to back up what she teaches, plus you can tell she truly cares about actors and wants them to do their best. Thanks Marci!" "If you've ever stood in an audition room and wondered, "What are the casting people thinking?"... Guess no more. Marci's DVD not only tells you how casting directors think, but tells you exactly what to do to make them think of you as a true professional. No more hoping you're doing the right thing. Here are step by step instructions on how to handle most any audition situation. Marci tells you how to take care of all the "business" stuff and leaves you free to hone your skill and talent. This DVD will save you years of trial and error. I wish I had this when I first started out." Wow... wonderful digestible golden nuggets of info. It felt very much like meeting a caring friend for coffee and getting insider tips. I have always read in acting books that the CD is on the actor's side, they called you in for a reason, they want you to do well. You discussed this and now I feel 100% fantastic. I just need to be prepared, be good, and walk away. I can control being prepared, being good and I can also control walking away. You pointed out so many reasons that things could not feel right in the room (lost financing, producer's son in the hospital, etc.) We shouldn't try to read anything into things out of our control. I don't know why but just hearing that made me feel so much better. I also loved the tips on eco casting. I have booked many roles (or got called in) from self taping but I always send my audition off a bit worried. You cleared up every question I had. Now I will send those auditions off with an air of confidence. I am so glad I decided to get the Marci Liroff DVD! I've gotten so many tips on ways to improve my auditions and I have yet to finish watching the whole DVD. Not to mention, I tried a few tips in my last audition and have a call back. SERIOUSLY! I'm SO EXCITED! THANK YOU MARCI! I can't wait to finish the DVD, replay an...d probably end up living all my auditions by it!!! I received my DVD copy yesterday and after watching it I firmly believe that this is a MUST have for all actors. Marci was able to do something that no institution was able to do. She effectively constructed a blue print on how to successfully brand your product, packaged it in an easy to follow format, and made it available for every...one in all demographics. Marci Liroff's "Bootcamp Audition" DVD is a must for every actor. I have been an Agent for over 12 years and the information on this DVD is a great resource. If you are a new to the business or a long time veteran, this DVD is a must have. "Marci Liroff's Audition Bootcamp is a must-have dvd in your acting bag of tricks! All of the information is presented in a clear and concise way that provides an actor/actress with just about all of the rules needed to ensure success during an audition. Of course there will be the occasional exception to the rule, but, Marci Liroff provides you with the strongest foundation possible to begin your auditions from." 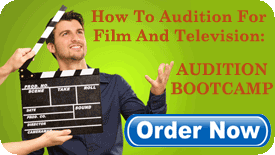 I highly recommend every actor to have Marci Liroff's Audition BootCamp DVD! Marci answers every question I ever had on how to give a great audition! I know now that I have a new found confidence and knowledge the next time I go on an audition! I wanted to try a self-taped audition but I didn't know how to - but now I do! Thank You to Marci Liroff for this DVD! I give It 10 Stars! "Just buy it. Go to the page and buy it. NOW. What a great DVD for everyone, from beginner to experienced. I hate the waiting room, I've always said it was the worst part about auditioning. Fear the wait no more! Great tips for what you can expect and what is expected of you. Here in Detroit, we have found ourselves suddenly meeting and being seen by people that many elsewhere would kill to audition for. She answers questions that we aren't allowed to ask because "we should know that already!" Marci's DVD was not only incredibly informative, but she presents very complicated information in an organized, very well designed, and easy to follow format. It is a must for everyone already involved with, or wanting to begin their venture into, the entertainment industry. This is the best investment anyone can make--it certainly was for me. 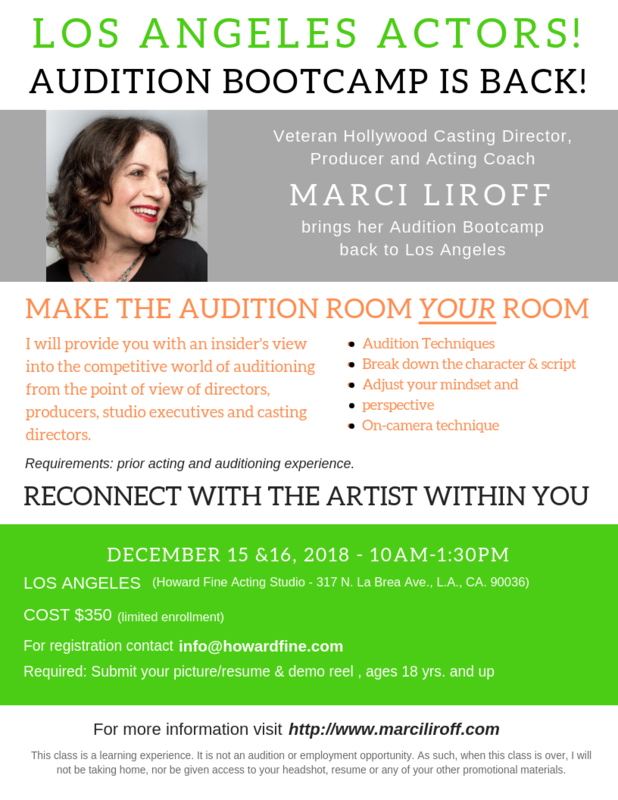 In her Audition Bootcamp DVD, Marci Liroff shares meaningful advice and insight from her heart for the sole purpose of helping us actors grow, gain a broader understanding of the audition and casting process, and improving our chances of building lasting relationships with Casting Directors. It's not about booking this one job. It's about building relationships for your career. This was the most meaningful and valuable training I have received in many years. The tools gained from watching this DVD, will make a significant impact on my acting career and in my life. "Initially, I purchased Marci's AUDITION BOOTCAMP DVD (Part One) out of love for the movies she cast, really. I was curious to hear her input about the casting process. But I'm glad I did, because there is so much helpful information in it! Other than the Audition Bootcamp Part, the DVD includes a part with helpful Tips to apply in the casting room, and a third part about How To Tape Yourself step by step instructions. Highly recommended!!" I'm an actor (SAG since 1976) and also worked for ten years as an asst./associate casting director in N.Y. and L.A. This is a terrific DVD. The wealth of experience and information is invaluable. She gives it to you straight. It helped me personally with an acting audition I had last week. I also lead an audition workshop here in Honolulu and have recommended it to my students. If you're an actor just starting out or whether you've been around the block a few times, you need this DVD. and I ain't blowin' smoke." "Marci's DVD is a must have in any actor's arsenal. No matter what level you are at, Marci breaks down all the myths and facts about casting and what you need to do as an actor to get the job. It's like you have a private one on one coaching session with her! Thank you so much Marci, for not only sharing your wealth of knowledge but for being a fan of the actor." Marci, I love your DVD! This is like an entire season of crucial info packed into one package. You have a comfortable presentation style (give me a moment) OK, your style is a pleasure to listen to and you often present a fresh perspective on the solid basics as well as bringing fresh insights to the actor. I highly recommend that actors add this to their arsenal of study materials! I will watch this again and again. Thank you! I always wanted to know what casting directors look for, and now I know. The DVD is the ultimate audition guide. There's an abundance of valuable advice and tips for anyone serious about acting. I think those who have this DVD will definitely have an advantage by knowing what to do to prepare and knowing all the dos and don'ts. It has helped demystify the audition process for me. The information presented in the DVD is very straight forward and easy to understand. I know I will definitely watch this again and put into practice all that I learn from it. Thank you Marci for putting together such a valuable resource!